There is a proverb that says something like, "Invade a moyo one move before it becomes territory." (not sooner) . AshleyF: At my level this is a new concept. While watching a lecture by James Kerwin, 1p on KGS Plus my main personal takeaway was from the below position. I'm going to try to explain my understanding of it but please, please, some stronger player come along and make this clear! He said that was excellent timing . One more move and Black would turn the bottom into territory. To my kyu-eyes it seems too late; why not invade when it would be easier to live (maybe more of a reducing move like at )? I believe his reasoning is that will certainly be worth something. Playing earlier would also, but the value of the invading stones themselves would be the same for White. That is, White is going to have to run and make no points (only erase points) or sacrifice the stone to make something else work or play on the inside and be lucky to just barely live with two points. Invading a bit earlier or right now makes very little difference as far as the 'positive' value of the invading stones to White. Invading this area much, much earlier before the moyo was even formed is different and wouldn't be considered invading too early. I think Mr. Kerwin's main point was that when evaluating the outcome of this (or any) engagement the relative initial strengths need to be taken into consideration. Considering how it turned out without considering how it started is inaccurate. 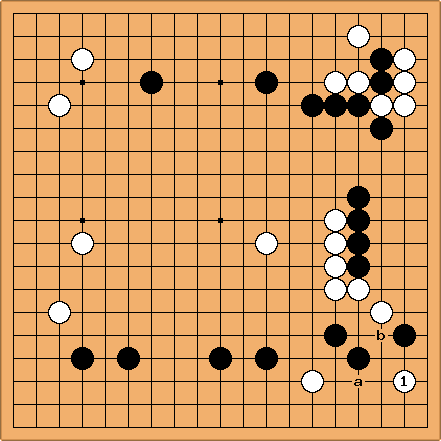 Letting Black invest more stones in this side (but not quite securing it) maximizes the ratio of B/W. This means that White needs to get very little out of this skirmish to be happy with the result. The more Black invests, the less White needs to get. Since we already realize that White will get very little (zero or two points), regardless of whether he invades now or a bit earlier, let Black keep investing and wait for the very last possible moment. Stronger Players: is this a correct way to think about it? Alex Weldon: That's one way to think about it. Personally, I would use slightly different logic to arrive at the same conclusion. My way of looking at it is that a move in an area of the board is only urgent if the opponent can achieve his desired goal there (e.g. turning it into solid territory) with a single move. If turning a moyo into territory will take him at least two moves, you can think of the set of his possible moves in the area and the set of your correct invasions in response to those moves as a kind of miai. As long as you have a good invasion or reduction in response to any move he makes, there are most likely going to be other areas of the board that are more urgent because the same sort of miai sets don't exist. Calvin: I like the miai idea. But it also seems to me that this timing may be related to the idea that such a play may often be tedomari, depending on the rest of the board, and would therefore count nearly double according to the proverb. Certainly if it takes two or move moves to seal off an area, then only the last one would be tedomari. AshleyF: That make sense; early invasion not being urgent because it's a kind of miai. That's definitely a nice and understandable explanation for why it makes sense to 'Invade a moyo one move before it becomes territory'. "...in fact the lower side is not territory even after this move ( ). As a general matter, one of the most favorable times to invade a position is the move before it becomes territory. ... The move before it becomes territory is an excellent time to invade because the stronger a position is the less you need to get as the reducer to be satisfied." This idea of letting Black build so that the relative value is more in line with what each player 'deserves' (knowing White deserves very little) is the most interesting thing to me. I've never thought of it like that. I think that's what Mr. Kerwin means; not entirely sure. kritz o.k. - This may sound really stupid ... but is there a reference that discusses how to "create" a living group at the invasion? (How much space is needed) The only way I can figure out learning this is making a series "unreasonable"invasions. Bob McGuigan: Obviously there is not going to be any simple set of conditions for having enough space. If you look at small living groups, together with all the adjacent intersections, it seems you need at least 25 points of free space. But usually you also need something more, such as nearby stones you might threaten to connect to, an escape path to the outside, or exploitable weaknesses in the defender's shape. If there are enough of these sorts of things you can wedge yourself into fairly small spaces. There is also the fact that an invasion might be unreasonable not because the invading stones die but because the defender's position is strengthened too much through moves that force the invader to defend locally. And sometimes you might make an invasion that you expect to die because you will use it to make profitable moves on the outside. kritz : Thanks - but when I look at the diagram above, it seems black can cut the "greater than 25 points" down to something much less with two "enclosing moves." Maybe it is the ability to run left - right- and out that makes it work for white. Alex Weldon: Niklaus is right, of course, that reading things out is the best way. But if you're playing a fast game and don't have time, or if you're like me and have reading skills far below your overall level of play, intuition goes a long way. The trick is to look at all the possible moves in the vicinity that look like good shape and are likely to be in some way forcing. The more you have, the easier it will be to live or escape. Then you just need to develop an intuition for how much is enough. To me, looks like a smart move not because I've read it out, but because a through f all look like effective follow-ups and Black can't defend against all of them at once. Of course, what happened in the actual game was that White made a second invasion at g with the intention of making miai of living with one or the other. That, of course, requires reading, since the distinction between miai for life on one side or the other and Black being able to kill two birds with one stone is not a simple one. For example, . a and b is miai for white. If Black cuts with move b, then white can connect and make its base in corner playing move - a. Otherwise, white sacrifice its lower-side stone and get corner. Too big damage for Black. Tderz: Miyamoto Naoki's "Breakthrough to Shodan", page 89 states "The most effective blow is dealt by waiting just until before White (the moyo builder there) attains an ideal formation". That means you (would be Black) made many effective moves elsewhere.